CentOS 6 is an Enterprise-class Linux Distribution derived from sources freely provided to the public by Red Hat. CentOS conforms fully with Red Hat's redistribution policy and aims to be functionally compatible. CentOS mainly changes packages to remove upstream vendor branding and artwork. CentOS 7 Linux distribution is a stable, predictable, manageable and reproducible platform derived from the sources of Red Hat Enterprise Linux. CentOS 7 conforms fully with Red Hat's redistribution policy and aims to have full functional compatibility with the upstream product. Debian 8 ships with several desktop applications and environments. Among others it now includes the desktop environments GNOME 3.14, KDE 4.11, Xfce 4.10, and LXDE. Ubuntu 16.04 is a Long Term Support (LTS) release. With Ububtu 16.04, the kernel crash dump mechanism now supports remote kernel crash dumps. It is now possible to send kernel crash dumps to a remote server using the SSH or NFS protocols. Faster and more reliable SSD storage increases your Plesk VPS Servers' efficiency and offers a tremendous performance boost. Currently, SSD storage is available only on our India Datacenters. 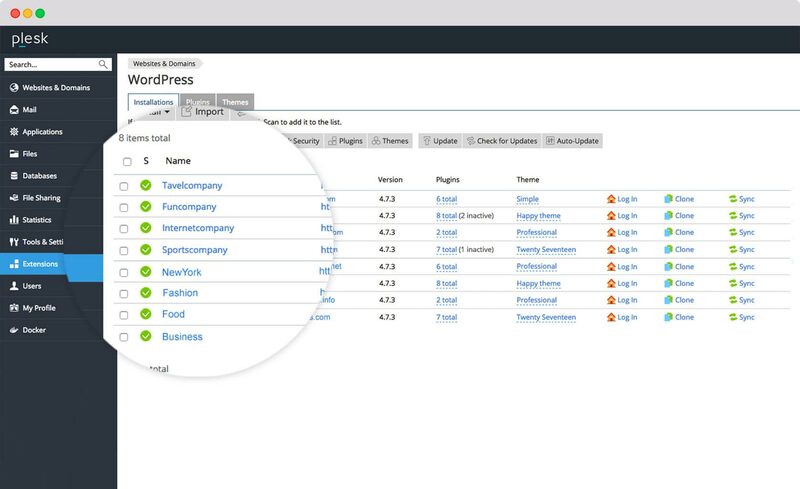 Integrated WordPress toolkit secures and mass-manages multiple WordPress instances, plugins and themes. Only Plesk 30 domains & Unlimited Edition includes staging and cloning functionality so you never have to code on a live site again. 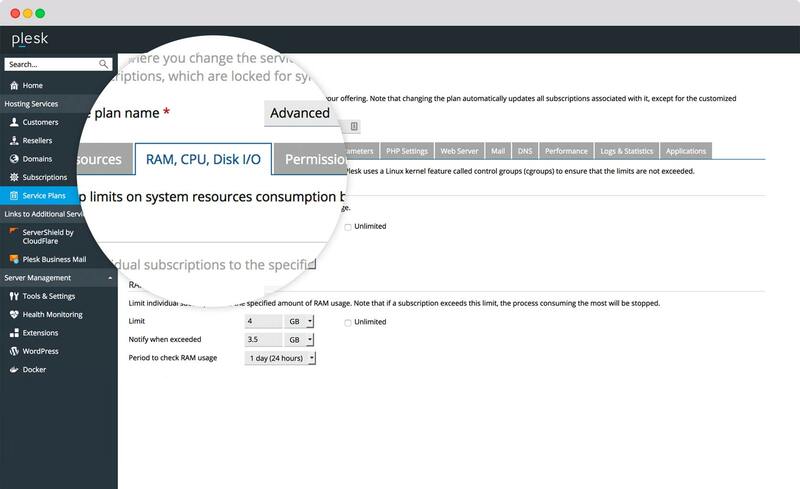 Use pre-configured security settings for various authentication methods, anti-spam or anti-virus protection, automatic updates and vulnerability monitors with our plesk hosting. Easily integrate with Fail2Ban, CloudFlare, LetsEncrypt or Symantec that can automatically secure Plesk, new domains, subdomains and webmail with SSL certificates. Improve the Apache web server performance by using Nginx, a supplementary high-performance web server which is typically used as a Reverse Proxy server and Caching. This is a great tool for users that are unfamiliar with server management tasks. Example: High CPU load or Low free disk space. 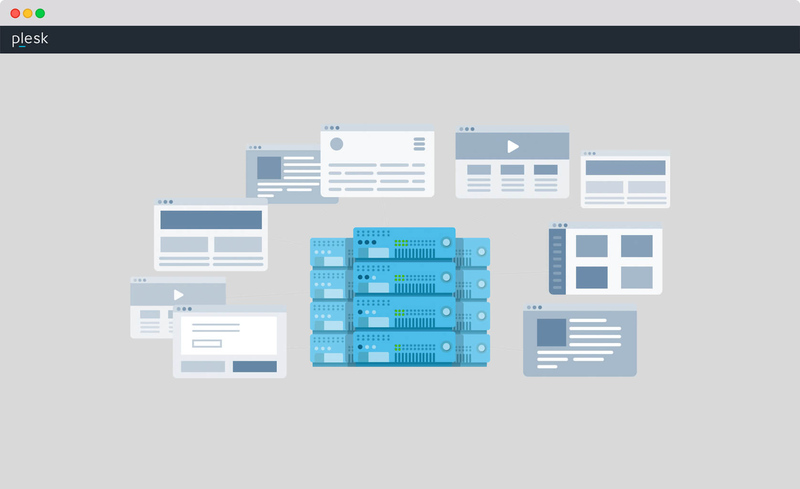 Customize the server environment and build your own plans. 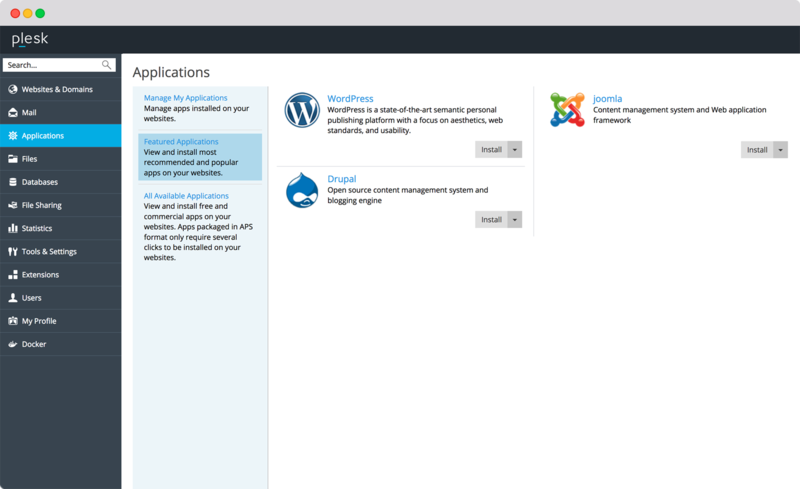 Plesk lets you seamlessly manage websites, web applications, emails, resellers, customers, etc. VPS plesk hosting that allows you to build a familiar environment by choosing from various Linux distros like CentOS, Ubuntu, or Debian. Deploy and manage docker containers locally and remotely. Increase productivity and rapid deployment with Docker integration. Increase productivity and rapid deployment with Git integration. Supports all backup functions like Incremental backups, Scheduled backups, Granular restoration and much more. The backup can reside on the plesk server or remotely on popular cloud storages like AWS S3, Google Drive or OneDrive. Confused Between Plesk & cPanel? Plesk is a Windows and Linux compatible web hosting control panel that allows you to easily manage the different aspects of your hosting account such as - files, applications, customer accounts as well as email accounts on the server. It provides users with a simple and convenient GUI (Graphical User Interface) that enables one to start their hosting business quickly and maintain it without many efforts. Our Plesk VPS hosting offers Plesk installation on Linux distros only. Do I need to install Plesk? You don’t need to install Plesk as it comes pre-installed with the choice of your Linux distro. All you need to do is select the operating system that you need and the Plesk version that you require before deploying it. In addition to this, you can also manage your user account and web hosting, upload content, manage web applications and add domain aliases. What are the different Plesk licences? How secure is the Plesk Web Hosting Control Panel? What is the SEO toolkit inside Plesk? Plesk also has SEO Advisor tool which will provide you with a to-do list, to help you rank better on SERP. It will give you a list of items to optimize your website as per the latest SEO standards including header tags, duplicated content, etc. VPS Hosting facilitates total isolation. This implies regardless of what different clients may do on the server, your VPS bundle will remain unaffected. The root access allows you to install any applications that you want. VPS additionally gives you ensured assets, so regardless, the CPU, RAM, HDD and Bandwidth assigned to you, ResellerClub’s VPS bundle will dependably be accessible for your applications. It gives all of you the highlights and elements of a Dedicated server, without the extra expense. KVM or Kernel-based Virtual Machine is a virtual private server which sits over a physical Dedicated server. Assets that are committed to the KVM VPS and are not imparted to different clients on any devices so as to provide huge dependability and execution prowess. Absolutely! You can avail additional IPs on the VPS server, contact your Account Manager or our Support to get one. 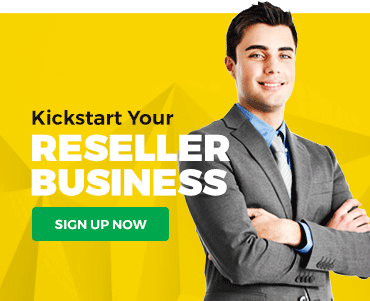 ResellerClub offers 24x7 support via toll-free call in support, feel free to get in touch with us for any product support or information. You are in charge of your website’s backups and web content. To be on the safe side, we suggest you keep duplicates of your content safe and make your own reinforcements and backups. You can get your backup from cPanel or utilize a remote reinforcement/backup solution. We also offer CodeGuard to keep your website data back-up. Sorry, but an automatic upgrade or a downgrade is not present for VPS Hosting plans at the moment. You can contact your Account Manager or our Product Experts to get an upgrade or downgrade. Docker on Demand - Access Redis, MongoDB, Memcached and more. Unparalleled Compatibility - Support for Apache, NGINX and Litespeed and platforms including Debian, Ubuntu, CentOS, Red Hat Linux and CloudLinux. One view, one dashboard - One place to manage subscriptions and services. Exceptional CMS platforms - Dashboard for a master view of all your Joomla!, Drupal and WordPress projects. Role-based permissions - Easily manage permissions for teams of all sizes and across multiple projects.